You Can Do It, Put Your Back Into It features over 30 artists and their take on the motivational poster. There is such a deep historical well to draw from for this theme, such as the fabulous Mather Work Incentive posters of the 1920s, through propaganda-style work from WWII and of course the proliferation of Pinterest-ified typographic inspiration that dots the internet landscape today. 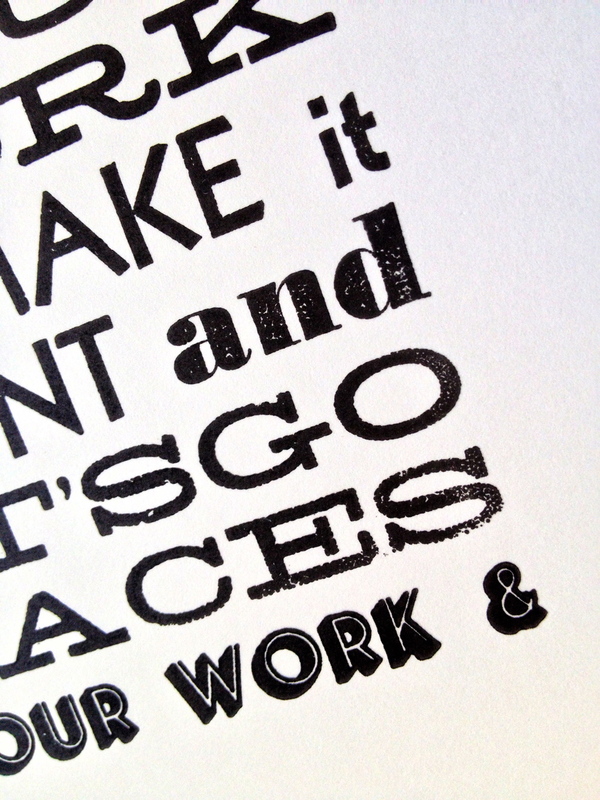 For my piece, I decided to create the poster by starting in the analog letterpress world and finishing in the digital. Here are some process shots, along with a sneak peek of the final piece, which was created by printing vintage metal type and borders and then scanning the results. The quote that I ended up using for my piece was "Plan your work and work your plan". Not all of the text that I printed ended up in the final piece. Since I was scanning and manipulating the text digitally, I didn't have to worry about spacing (note the lack of a space between "LET'S" and "GO") or setting text for repeating words. I used a variety of paper texture to play around with the level of "saltiness" I wanted in the final work. I love that I created a digital design with "trendy" distressed texture that was actually created from ink and metal.